We are in the final month of our Coastal CURA, but we are still busy working to finish up numerous projects. The final, special edition, of our Coastal CURA Newsletter is now available here, and our film, A Coastal Partnership, will be distributed across Canada and beyond by the end of this month. We are also happy to announce that both A Coastal Partnership and Sharing the Waters are available for viewing on our website! We would like to welcome our new Communications Assistant, Pawel Porowski, to the Coastal CURA Team. Pawel will be working with us to, among other things, develop our Coastal Partnership film distribution strategy, film packaging design, and the final edition of the Coastal CURA newsletter. Part time employment opportunity with Coastal CURA. Job Description here. Applications are due by Wednesday October 19th, 2011. The Coastal CURA capstone film, A Coastal Partnership, is now available for viewing on the Coastal CURA Website. View the film here. The General Proceedings for the People in Places Conference are also available online, here. MARE People and the Sea VI - Bridging science and policy for sustainable coasts and seas. Bridging science and policy’, the central theme of the 6th MARE People and the Sea conference, addresses how science can better connect with policy to support progress towards sustainable coasts. This builds on a longstanding ambition of the MARE conferences to encourage interconnection amongst different sciences, with particular emphasis on social science and trans-disciplinary contributions across the science-policy interface. As is often observed, science frequently remains fragmented and contested, particularly across economic, social and natural science domains. The field of policy is no less problematic. Disciplinary orientations are often reproduced in the sectoral organization of government agencies and their policies. Policy-makers tend to reduce complex problems to simple and seemingly manageable proportions. This often leads to contestations in which scientific activity and knowledge become a weapon legitimizing certain understandings of environmental-societal problems and solutions and discarding others, rather than being a neutral input for an uncontested societal activity. The 6th MARE conference specifically aims to re-connect the myriad of disciplines which seek to promote sustainable coasts with processes of policy and decision-making. By doing so, we endeavor to provide insight into the different framings of complex problems, and to bridge the common gap between scientific and policy domains. The underlying assumption here is that joined-up science which seeks to engage with the policy process can facilitate progress towards workable and sustainable fisheries and coastal policies that are socially, environmentally and politically workable. The People in Places Film Festival will highlight some amazing films from across the globe, with themes surrounding community efforts in managing coastal, marine, and terrestrial resources. Conference delegates, as well as the general public, are invited to attend this FREE PUBLIC EVENT. Film authors will be present at the event to answer audience questions after the viewings. This is another amazing opportunity to come out and learn what is happening in coastal and oceans management across the world, to network and interact with those in the field of natural resource management, and to learn from others. Coastal CURA is happy to be able to offer these film events in collaboration with the International Oceans Institute Film Festival (June 15, 22, 26 & 27), and to celebrate Oceans Month 2011. This event is the world premier of the Coastal CURA Film, A Coastal Partnership: Maritime Stories of Integrated Management. This film represents many months of hard work by former Coastal CURA student Sarah Bood. The film is dedicated to exhibiting a strong maritime commitment to integrated management. Across the Canadian Maritimes there are many unpublicized stories of coastal community heroes, groups of people working together to protect the health of their fisheries, watersheds, and community heritage. 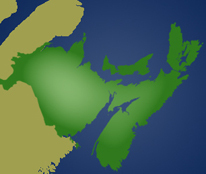 A Coastal Partnership is a documentary on four coastal communities in the Canadian Maritimes: the inshore fishery of southwest New Brunswick, Lennox Island First Nation in Prince Edward Island, Bear River First Nation in Nova Scotia and the Independent Clammers in north-western, Nova Scotia. Linked together through the Coastal Community and University Research Alliance (CURA), members from these communities have been working with academics to document their efforts and identify what they need to become more involved in coastal management decisions. Join us to watch this amazing film and participate in the continued celebration of Oceans Month with Coastal CURA. CURA Conversations - A Multi-CURA discussion with regards to what works and what does not, with respect to creating a strong and effective partnership between community and academic partners. Melanie Wiber was on CBC radio this morning, talking about the LEK study: Fishermen's on the water observations on the effects of aquaculture on the traditional fishing industry in Southwest New Brunswick. You can listen to her interview here: http://www.cbc.ca/informationmorningns/2011/06/studying-the-effects-of-acquaculture.html. You can also read the LEK study, below (May 2011). op-ed piece about saving our coasts and oceans for the Chronicle Herald. Coastal CURA (Community-University Research Alliance) will be participating in Ocean’s Day, June 3rd, at the Maritime Museum of the Atlantic with many other environmental organizations in Halifax. Coastal CURA partner, Hubert Saulnier, is now famous via You Tube! The Coastal CURA Fall 2010 Newsletter is ready for your viewing Pleasure. Check it out here. Press Release and Video Clip re: Coastal CURA student Velta Douglas and her work on Integrated Management of the Saint John Harbour with High School Students in the Saint John, NB area. From July 29-August 5, some of our Coastal CURA Students and Partners had the pleasure of meeting participants in the People of the Tides project, based in Brazil. Courtenay Parlee, a Masters student with Coastal CURA spent much time organizing activities and knowledge exchange opportunities for the group (read about it here) - Thank you Courtenay for you amazing work! We have been working hard to produce a new brochure as well as a postcard, both of which highlight our upcoming conference, People in Places, next June 2011. Many of our Coastal CURA partners attended the Coastal Zone Canada Conference in Charlottown, PEI from July 25-29. Please find below a selection of our paper presentations, and a short brief on our Community Forum session. Congratulations to Randy Angus and Melanie Wiber for their well received Plenary Session on Communities at the Front Line. Coastal CURA held a Multi-Stakeholder Dialogue on Community Involvement in Integrated Ocean and Coastal Management. We would like to thank our government guests and community partners for participating in this timely discussion. We look forward to hosting a follow-up session in Spring, 2011. For more information on these sessions, please contact us at coastalcura@smu.ca. The Coastal CURA has been accepted into the Coastal Zone Canada Conference 2010, to be held from July 25-29 in Charlottetown, PEI. The partners have been busy organizing a Workshop session as well as a Plenary and a Community Session. Congratulations to the CURA team for its recent publication of "Integrated Management: A Coastal Community Perspective", published in the Policy Research Initiative journal Horizons (March 2010 Volume 10, Number 4). The Fundy North Fishermen's Association recently won the Gulf of Maine award for environmental stewardship. The award was received for the ghost trap retrieval project, which Fundy North undertook as part of a Harmful Alternation, Disruption or Destruction (HADD) project in Saint John Harbour. Congratulations, too, to all the CURA students who worked on the water as part of the retrieval process. Congratulations to Hubert Saulnier and the Maritime Fishermen’s Union. Their Clean Oceans Initiative has been awarded the Gulf of Maine’s Visionary Award because of it’s efforts to reduce marine debris. Read about it here. Donna Curtis won a best poster blue ribbon prize at the Annual Rural Sociological Society Meetings in Madison, Wisconsin this August. Congratulations Donna! View Donna's award winning poster - Bringing Local and Scientific Fisheries and Aquaculture Knowledge Together. Courtenay Parlee recently won the best photo competition at the Oceans Management Research Networks conference in Ottawa. Congratulations Courtenay! View Courtenay's award winning photo here. References for "Is the Clamming Industry in the Annapolis Basin in Jeopardy as a Result of the Digby Sewage"